FarmStart Abbey Leys is a one-of-a-kind initiative, offering a low-risk environment in which new organic growers can develop and test their growing skills, business plans and marketing strategies, plus access a training programme, certified organic land, packing and tool storage facilities, and peer support. It’s based at Abbey Leys organic farm, near Knutsford in Cheshire. 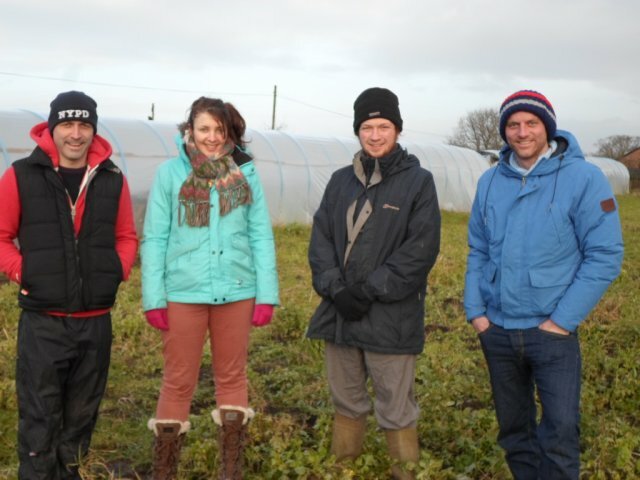 2015’s first-year FarmStarters (our TestCroppers) are Steph, Paul, Chris and Julian. All have experience in growing, some beginning in childhood! (Steph got stuck in on her parents organic veg patch, Julian on his cousin’s farm in Wales) and Chris gardened professionally in London. This year the TestCroppers are undergoing a new and improved training programme, to help them make the leap between growing on a hobby/allotment scale to field-scale commercial production. For their first 12 months, they’ll share a small plot between them, and get to grips with the huge range of topics they need to know about to run a successful growing enterprise - from growing under plastic to book-keeping, and soil bed preparation to pricing, packaging and estimating the harvest. “Since our first meeting at the end of January, I feel like I've already learnt quite a lot. We've been lucky enough to have two sessions spent with Jenny Griggs from Fir House Farm - the first was on crop planning and by the end of it we'd managed to plan and put together a shopping list for a whole year's worth of veg growing! This was pretty exciting, and for the next couple of weeks I really couldn't wait to get out on the site and start work. Before that, however, we had the second training session all about finance, forms, and Soil Association certification requirements. By the end of the day I was glad that I wasn't having to negotiate all of the complexities alone!! The first few weeks of training culminated last Saturday when we spent our first day outside, planting onion and tomato seeds, and learning how to use and take care of the various bits of equipment and machinery that FarmStart makes available to us. The weather was perfect and we really couldn't have wished for a better start to our course. It's been nice getting to know my other Test Croppers and our course co-ordinator Alex, and we're slowly meeting a few of the more experienced FarmStarters on the adjacent plots... Right now, I'm looking forward to the rest of the year!!" Test Cropper Steph Robson. As well as improving the FarmStart programme for our own new farmers, we’re working with others around the UK to make the training we provide “the mother of all training programmes”, as our Helen puts it! Click here for more on that.